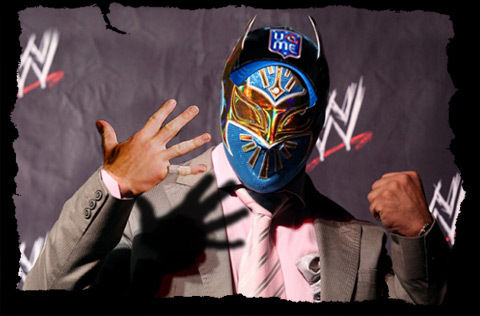 Headlies: JOHN CENA TO MENTOR SIN CARA, TEACH HIM HOW TO WRESTLE / RUMOR: VINCE MCMAHON HAVING AFFAIR WITH STAMFORD SUPERCUTS EMPLOYEE / DESTITUTE LEX LUGER SCRAPS STEEL FOREARM PLATE FOR CASH - WrestleCrap - The Very Worst of Pro Wrestling! London, England – After international lucha sensation Sin Cara (the man once known as Mistico) made a couple errors in judgment during his first televised WWE match, WWE Chairman Vince McMahon has made the call to scale back Cara’s push until it’s felt he’s ready to handle the responsibilities. McMahon feels that simply sending Sin Cara to FCW for further training would be counterproductive, as a good amount of money and promotion has been sunk into the international superstar. So, at least for now, McMahon has tasked his biggest star, John Cena, with helping mold Sin Cara into something presentably competent. Despite the harsh, blunt criticism, Cena teamed with Cara this past Monday on Raw from London, and the pair defeated WWE Champion The Miz, and his lickspittle, Alex Riley. Cara admits that he’s struggling to learn the WWE style, but remains determined to make the most of his opportunity to perform for the sports-entertainment standard bearer. Stamford, CT – Fans the world over were questioning why Dolph Ziggler abandoned his greasy three-dollar gigolo haircut this past Monday during Raw in favor of a very ordinary brunette crop. Others noted that this was just the latest in a long-line of perforrmers dating back to men like Test who sported unique hair styles suddenly dropping them for more standard cuts. It’s a move that’s baffled both fans and wrestlers alike for years, but one WWE Superstar thinks he has the answer as to why the changes are being made. Atlanta, GA – Times have been tough with the downturn of the American economy. With rising oil prices, skyrocketing unemployment, and no end in sight for this strife, many Americans have undertaken desperate measures to make ends meet. Lawrence Pfohl, professionally known as Lex Luger, has been retired from the business for five years. In 2007, Pfohl tragically was hospitalized with a “spinal stroke”, which has limited his mobility, and has made it difficult for him to walk. Recently, Pfohl, 52, has had a steel plate, one that was surgically implanted in his forearm in 1992, removed. Pfohl’s surgery was successful, but there presented another problem. Pfohl, however, has another option for raising the money needed to pay for his surgery. The RD & Blade Show: Episode 39 – A Tribute to Roddy Piper!